The Caribbean has always been a popular golf destination, but today there are more choices than ever for golfers. The Dominican Republic has emerged as one of the world's best golf destinations—Casa de Campo's Teeth of the Dog course is listed as one of the best in the world by Golf Magazine, for example— and you can even find golf in such unusual destinations as Cuba and Haiti. So pack your clubs for your next trip to the Caribbean, and experience firsthand the fun of playing golf under the tropical sun. This links course at the CuisinArt Golf Resort & Spa has 14 sea-view holes that distract duffers with panoramas of the Caribbean and nearby St. Martin/Maarten. But keep your eye on the ball, because the course is full of lagoons and ponds, including one stocked with bonefish if you decide to throw down the clubs and pick up a rod and reel. This par-71, 18-hole championship course in St. John's is located next to the Jolly Harbour Marina in a lush tropical setting and winds around seven lakes. This Robert Trent Jones II designed course is Aruba's only 18-hole championship golf course. It's a par-71, 6,811-yarder that highlights not the ocean but rather Aruba's arid outback of cactus and Divi-divi trees. The Abaco Club is home to a wonderful seaside, Scottish-style links course (minus the harsh wind and stony soil), a par-72, 7,138-yard masterpiece. It also includes a world-class practice facility that includes a double-edge range and a short-game practice area. The Grand Lucayan resort on Grand Bahamas Island features a championship 18-hole golf course designed by Robert Trent Jones, Jr. The open and breezy course has 6,909 yards of greens and fairways scattered with bunkers, rough, and water hazards. Golfer magazine named the course as one of the Top 100 Golf Resorts in the World, and it hosts several national championship tours. The exclusive Lyford Cay gated community on the west end of New Providence Island is built around the Lyford Cay Club, a members-only institution with an 18-hole championship golf course ranked among the world's best—if you can get an invitation to play. The luxury Ocean Club neighboring the Atlantis resort on Paradise Island boasts a Tom Weiskopf-designed resort course that will appeal to weekend warriors and serious golf fanatics alike. Greg Norman designed this championship 18-hole course on the Bahamas out-island of Great Exuma. The oceanfront fairways run past sand dunes and tall seashore grasses to end on a final hole at the end of a spectacular peninsula. It was named one of the best resort courses in the Caribbean by Travel & Leisure magazine. Sandy Lane is where Tiger Woods got married, so need we say more about the quality of the golf here? The resort's Green Monkey course (named for the green Bajan monkeys you may see scampering across the greens) was designed by Tom Fazio on the site of an old quarry, the walls of which tower over some of the fairways and bunkers. The Tom Fazio-designed course features 18-holes, is a par 72, and has 7,343 yards. However, you can only play if you stay at the pricey Sandy Lane resort and are willing to shell out a greens fee in the $400 range. The members-only Mid Ocean Club is one of the oldest golf courses in the region, having opened in 1921. The championship 18-hole course in Tucker's Town can only be played by invitation or by members or their guests, but hotels owned by club members also may be able to get you a tee time on Mondays, Wednesdays, or Fridays. Remember, if you're going to wear shorts to play, they must be modest "Bermuda-length". This public course was designed by Robert Trent Jones, Sr. with perhaps the most famous hole in Bermuda: the par-3 16th where the water hazard is the Atlantic Ocean (don't bother trying to retrieve your ball). That's just one of many challenges on this scenic par-71 course. This recently redesigned course is acclaimed not only for its great resort course but also the fine dining to be had after a day on the links. Available to members and resort guests only, the course runs along Castle Harbour and Harrington Sound. This links-style course on Grand Cayman is the only 18-hole championship course. It lays alongside North Sound and follows the island's natural terrain. It's a 6,605-yard par 71 near Seven Mile Beach, making it possible to play a morning round of golf and still be on the beach early enough to work on your tan. Since Cuba doesn't consider cigars counterrevolutionary, it's fitting that this last bastion of Socialism also should put up with the decadence of golf. Varadero is Cuba's premier beach resort catering to foreign visitors, and this 18-hole championship course (the first of its kind in Cuba) is located near all of the area resorts, including Superclubs Breezes, the Melia Las Americas, the Melia Varadero Hotel, Hotel Sol Palmeras, and Sol Club Sirenas Coral. Who says you have to stay at a big luxury resort to get access to the best golf courses in the Caribbean? The resort complex on the former Blaauw plantation and delivers world-class golf alongside beautiful Blue Bay. This Jack Nicklaus course, Punta Espada, is the first of three for the Cap Cana Resort. At this course, 15 of its 18 holes overlook the sea, and the landscape includes bluffs, beach, and jungle. The Casa de Campo resort's Teeth of the Dog, Dye Fore, and The Links courses already have become legendary among golfers. Designed by Pete Dye, the Teeth of the Dog (named for the jagged coral formations along the coastline) has been described as "labyrinthine"—perhaps a warning to casual players—but The Links may be the more challenging of the two. Many a ball has found the Caribbean on the Dog's fifth through seventh holes. Dye Fore is the diabolical designer's latest Campo creation. Located on the north coast of Hispaniola near the Dominican town of Rio San Juan, Playa Grande is one of the last courses designed by the legendary Robert Trent Jones, Sr. The par-72 course sits atop towering cliffs overlooking the beach and sea, providing extraordinary views. The Puntacana Resort & Club features 45 holes of championship golf. Tom Fazio designed Corales Golf Course with holes on rocky cliffs and coral reefs. The other course, which is another Pete Dye design, consists of 27 holes on 7,152 yards. La Cana Golf Course is noted for Dye's signature pot bunkers, including the 21 that dot hole 7. The nine holes at the Grenada Golf Course represent the island's best golf experience; they also represent the only golf course on the island. Still, the course offers nice ocean views, and the greens fees are quite reasonable. This public 18-hole, par-71 course was designed by Robert Trent Jones, Sr. and is known for its windy conditions and multiple water traps, offering a serious challenge to all who play. Montego Bay's Half Moon has been called the best golf resort in the region by Caribbean World magazine, and the golf course has been recently renovated to better suit the modern game. The course was designed by Robert Trent Jones, Sr. and modernized by Roger Rulewich. "Like [plantation mistress Annee Palmer], the legendary 'White Witch of Rose Hall,' the course is alluringly dangerous and unpredictable," says designer Robert von Hagge. "Just as her personality might shift without warning, so do the winds, turning a six-iron shot in the morning into a five-wood late in the day." White Witch Golf Course is dotted with rock outcroppings and cut by ravines, with ocean views on almost every hole. It's a par-71 and 6,758 yards long. An all-inclusive stay at the Hilton Rose Hall Resort & Spa includes golf at the resort's renowned Cinnamon Hill Golf Course, which features great ocean and mountain views. Golfers can warm up on an open front nine before tacking the more challenging back nine filled with traps and dense foliage. The Tryall Club course features a tee shot through the stone pillars of a historic aqueduct—part of a former sugar plantation—but this 18-hole, par-72 course doesn't rely on gimmicks to challenge players. Your best shot at playing this course, which edges along the Caribbean and the Flint River, is in the summer months; winter play is limited to Tryall Club guests. The Empress Josephine Golf Course in Trois-Ilets was designed by Robert Trend Jones, Sr. and makes full use of banks, trees, lakes, bunkers, and obstacles to provide 18 holes of challenging golf. From the seashore to the slopes of Mount Nevis, this Robert Trent Jones, Jr. course cuts through a former coconut plantation and tropical rain forest and around steep ravines. Monkeys may join your foursome as you make play your way along the side of an extinct volcano. This par-72 course features a 200-foot elevation change over its 18 holes and a final hole that compels players to hit their shot over a waterfall. Designed by Arthur Hills, it's a pretty resort course with views of the El Yunque National Forest and the ocean at one of Puerto Rico's most family-friendly properties. The fun begins and ends at the Palmas del Mar's exquisite clubhouse, but there's plenty of great golf in between. The Rees Jones-designed Flamboyan Course has been called the best in Puerto Rico, while the Palm Course is a resort course designed by champion golfer Gary Player. 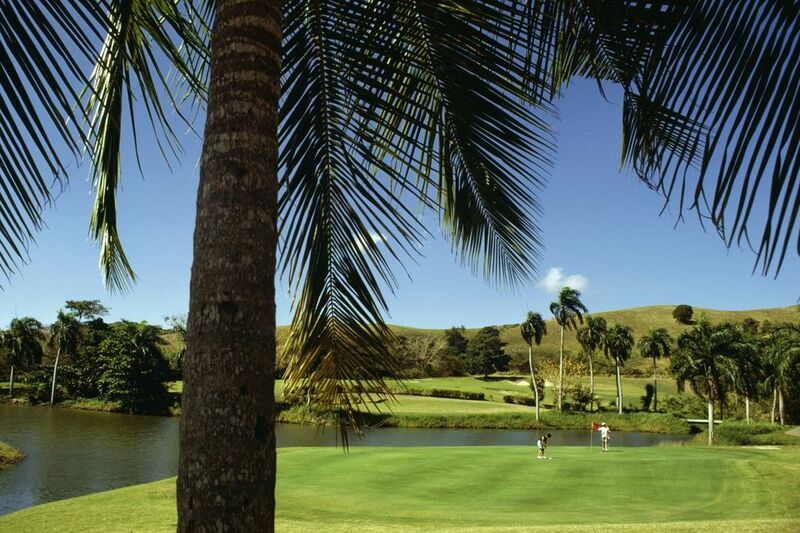 The Wyndham Grand Rio Mar Golf & Beach Resort has two championship courses. The Ocean Course, designed by Tom and George Fazio, tends to get more acclaim, notably its seaside 16th hole. The River Course is also memorable as its a Greg Norman design that follows the path of the Mameyes River. The Royal St. Kitts Golf Club has been called one of the most underrated golf courses in the Caribbean. It 18 holes are laid out alongside black-sand beaches and follow the natural terrain of the Kittsian coast. The all-inclusive Sandals resorts on St. Lucia share a 9-hole course with complimentary greens fees for guests. The course is set in a valley, making for a narrow, hilly and challenging course. You can watch the cruise ships out to sea as you ponder your tee shot from the elevated 4th green. Built in 1968, the 18-hole course at the Mount Irvine Bay Hotel provides a classic Caribbean golf experience, full of swaying palms and ocean views and aided by an attentive staff. "Rugged" is the best word to describe this Providenciales course, which challenges golfers not only with water hazards and sand traps but also a variety of natural limestone outcroppings. This course is not for the faint of heart. Billionaire Laurance Rockefeller gave golf-course design pioneer Robert Trent Jones, Sr. a blank check to create the course at the Carambola Golf Club, which opened in 1966. Jones designed thousands of courses in his career but considered Carambola one of his best, and generations of golfers agree.